So here’s something a little different. 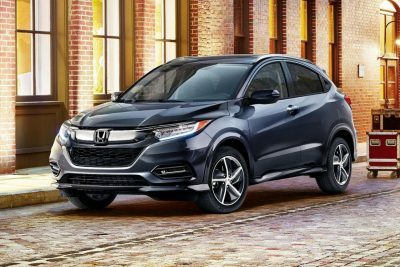 With so much choice in the small SUV sector we have another game player in the form of the 2018 Honda HR-V small SUV. 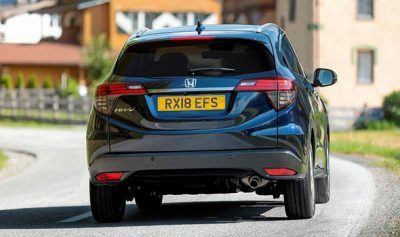 It’s a stylish compact number that is based on the smaller Honda Jazz chassis but with a raised height and a few other technological features found in its underpinnings. The new little HR-V competes with similar small SUVs like the Audi Q3, Ford Ecosport, Hyundai Kona, Mazda CX-3, Nissan Juke, and Toyota C-HR. But this is by no means the exhaustive list because this part of the SUV sector is hugely competitive. In this environment you need to have a few tricks up your sleeve to draw potential buyer’s attention, and I think that with the little Honda HR-V you have some pretty key points that will attract potential buyers to seal the deal. First of all let’s start with its styling. 2018 has seen a slightly mellowed HR-V exterior which still looks unique, like the old model, but with a matured taste. This should sit well for the discerning buyer that needs a reliable platform with a dash of style. For those who need the racy styling, the RS model will be the one for you with its piano black body kit, smoky chrome grille finish and 18-inch alloys making quite the fashion statement! New headlight inlays and LED technology have a brand new signature design to keep the HR-V looking its best and very cool. Essentially it is a FWD compact SUV that suits the city streets but can still find its way about on country roads and is more than happy to stretch its legs out on the highway. Traction control up front means that a muddy field is usually inside the HR-V’s capabilities; however you’re not going to get anywhere near as far as an AWD Jeep Compass or Subaru XV which compete in the same hotly contested market. These two are very happy to get there feet wet and muddy. The HR-V ride is very good; it’s composed, accurate and easy to drive – just like a modern Honda should be. The extra ride height is nice and so should appeal to those who like the commanding SUV view from the driver’s seat over what the lower conventional hatchback would otherwise offer. 2018 Honda HR-V engine specs remain unchanged with the familiar, but very good, 1.8-litre four-cylinder petrol engine with 105 kW of power (at 6500rpm) and 172 Nm of torque (at 4300rpm) doing the job nicely through a CVT option – only. The RS gets slightly sportier CVT programming to make it feel a little sportier in experience. Some might feel a little aggrieved with the lack of engine choice; you won’t be alone – it would be nice to see a diesel option or even a turbo motor in the RS with paddle shifters. The entry-level Honda HR-V VTi model is very-well priced. But with the competitive price comes an equally admirable specification list. Standard features include: a 7.0-inch touch screen with an in-built satellite navigation system, Bluetooth phone and audio streaming, USB connectivity, Android Auto, and Apple CarPlay. Premium HR-V models do come with the works! 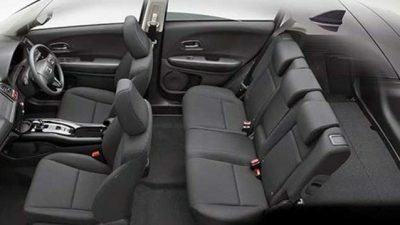 Climate control, leather seats, electric driver’s seat adjustment, a panoramic sunroof, an auto-dimming rear-view mirror, electric folding side mirrors, chrome exterior door handles, auto up/down windows for all doors, LED interior lights, dual-zone climate control, and front parking sensors are going to be liked – for sure! The Honda HR-V VTi-LX models also have the more comprehensive safety feature list with high-speed auto emergency braking (AEB), lane departure warning and auto high-beam lights leading the way. With a proven track record for reliability, upbeat styling, modern features and class-leading practicality the new Honda HR-V compact SUV is a likable companion for the road. For any more information on the new Honda HR-V or, for that matter, any other new car, contact one of our friendly consultants on 1300 303 181. If you’d like some fleet discount pricing (yes even for private buyers! ), we can submit vehicle quote requests out to our national network of Honda dealers and come back with pricing within 24 hours. Private Fleet – car buying made easy!